Ooui is a framework created by Frank Krueger, that lets you run Xamarin.Forms in a web browser. It actually has two ways of doing this, Ooui.AspNetCore, which is server side, or client side, using Ooui.Wasm. WASM is short for WebAssembly and to put it simply, it lets you run compiled code in the browser. 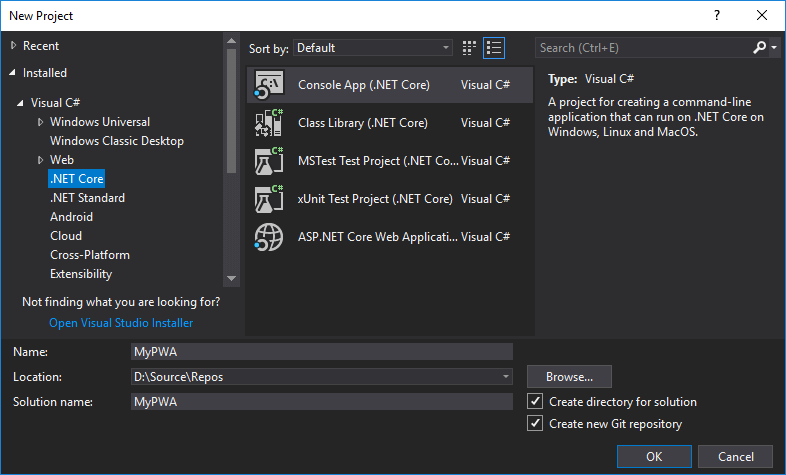 Mono was brought to WebAssembly with mono-wasm, that allows us to run C# on in WebAssembly. This is what Ooui.Wasm uses. At this point, we could now run Ooui, in WASM. To take this one step further, I have now created an example of how to load this in a PWA. Add these references to your Application. Add the following code to the Program.cs Main function. If you run this project, it will now output files in this directory. This can be loaded in the browser, without any server side technology. It is a number of static files. Note: If you want to run these locally, you need to run it from a server, not the local file system, due to some browser restrictions. Personally I use Web Server for Chrome, you just launch that, point it as the dist directory from above, and open the server from the link provided. Its nice and simple. This in itself is incredible. 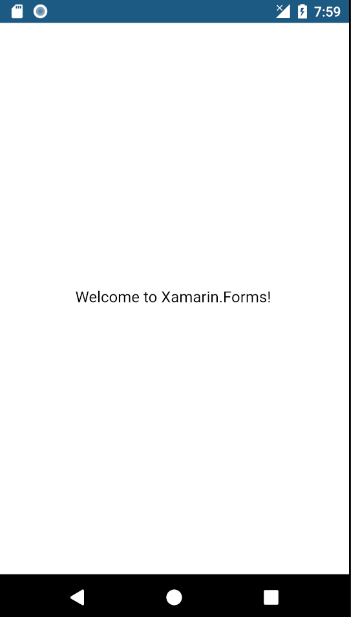 A Xamarin.Forms app, with XAML, running from static files, inside a browser, as a client side application. But lets take this further. Being able to install as an app on a mobile phone, with an icon on the home screen. 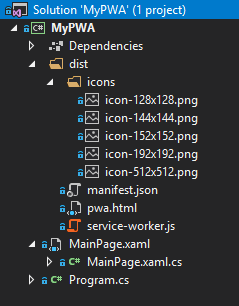 Just so I don’t mess with the existing files, in my project I have created a new folder called dist, and added folder icons, and files, manifest.json, pwa.html and service-worker.js. I’ll explain each of these in the following steps. All of these have Copy to Output Directory as Always, so they come out in the dist directory. I took the automatically generated index.html, and have modified it, to load a service-worker (a requirement to being seen as a PWA), added a link to the manifest.json, and added a title. A manifest.json file is required to let the PWA enabled browser know, about the app name, icons and the start url. I created the icons per the dimensions listed. The service worker, enables caching and offline storage, access to push notifications and more. For this example, we are just going to have a very simple, caching service worker. To run a PWA, we need a HTTPS capable webhost. I have just thrown it on my personal webhost with https access. These are just static files remember. I could even just throw these into Azure Storage. It doesn’t need to actually run anything, this all runs client side, in the browser. Just take the files inside the dist folder and upload them. First I load up my app by opening up chrome and going to the browser. Remember to go to the pwa.html not index.html, as we are using my modified version. It prompts me automatically to add to the home screen. If I click ADD TO HOME SCREEN, then I will get something like this on my home screen. Now I turn off ALL communications, mobile data and wireless and click on my PWA app. It first shows a splash screen. Then the app shows the loading icon, and it finally loads. This is an incredible accomplishment by Frank and with the added benefit of PWAs, this goes to an almost insane level. 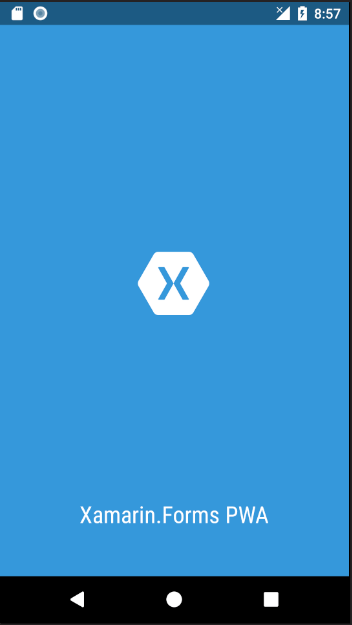 Think about it, we have a Xamarin.Forms application, installed to the home screen through a browser (not the app store), that runs offline and completely client side. I have to say, if anyone builds that bridge between Ooui and PWAs for service workers, this would be an awesome option for developing PWAs in the future. You should look at the Blazor project. Frank mentioned why he didn’t just use Blazor, somewhere in his GitHub repo, just can’t find it at the moment. 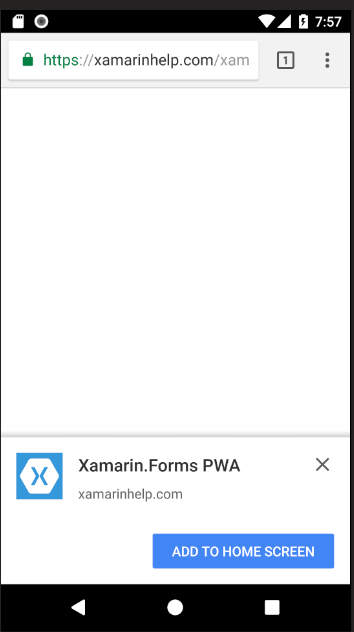 What about the size of the pwa? How big is it? This example project was 12MB. However most of that were .NET dlls such as mscorlib and other System. * files. Frank mentioned that implementing linking and doing a few other things could reduce that size significantly, but he hasn’t implemented them yet.